There are always interesting differences that emerge when you marry someone from a different family system. I never expected birthday traditions to be one of them, but life is full of surprises. I come from a family that celebrated birthdays, but did it as a rather low key affair. Mom baked our favorite cake. There were a few small presents from mom and dad, but we never did much of anything between siblings. In the childhood years birthdays meant you could have a sleepover (with a maximum of two friends). It was a special day that I looked forward to as a child, but as the years went by my feelings and expectations around birthdays diminished. As I progressed into adulthood, the low key birthday traditions of my family evolved into even more low key expectations. If my siblings and I even remember each other birthdays there may, perhaps, be a phone call or voice mail message with kind wishes, though even that is not an expectation. Once in a great while there might be a token gift or a gag gift, but those rare occasions are frosting on the proverbial birthday cake. My family is so bad with remembering birthdays that my siblings and I will occasionally text each other reminders knowing that it’s likely someone forgot. I’m not proud of this, mind you. It is what it is. Yet, along the journey I’ve come to realize that my low-key traditions and expectations surrounding birthdays are rather offensive to particular friends and loved ones. Wendy finds it appalling, and it only took one memorably disastrous birthday into our marriage to discover that I had better raise the bar for myself when it comes to the annual celebration of her birth. I’m a work in progress. All of this pondering about birthdays comes as I read Job’s lamentation this morning. His tragic circumstances cause him to rue the day of his birth. Forget being low-key about the date, he curses the day he was born. No matter where you land on the importance of birthdays, there is no doubt that the day of our birth has inherent meaning. It is a special date because it was the date we entered this world. 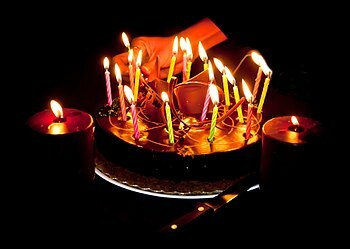 Birthdays, whether low-key or grand affairs, are linked to a celebration of life. To curse the day of our birth is to curse the precious gift of life that God purposed in our being and existence in this world. I hear in Job’s words the kind of extreme, all-or-nothing thoughts that I have commonly witnessed coming out of despair both in myself and in others. Our life can feel so terrible in this one moment that we are blind to anything worthwhile, life-giving, or redemptive about our lives to this point. Extreme circumstances birth extreme emotions which, in turn, produce extreme thoughts (and sometimes actions). I don’t find anything sinful or improper in this. It is altogether human to experience these thoughts and emotions. The threat that this brings to our lives is to either give in to the extreme thoughts and emotions until it conquers our spirit, or to deny the thoughts and emotions in what will be an unsuccessful attempt to pretend that we are unaffected by our circumstances. Either of these ultimately end in the diminishment of Life. Today I am thankful for Job and the day of his birth. I am thankful for the example he gives us in the honesty of his grief. This important human emotion, when experienced and processed in healthy ways, can lead to a deeper understanding and appreciation of life. I am also thinking today about birthdays and my relative nonchalance surrounding them. Birthdays are a celebration of lives that mean a lot to me, and lives that have deeply impacted me and my own life journey. They are an opportunity to say, “You are important to me.” Lesson noted. I’ve got some work to do.